This gallery provides an overview of mail service in America from colonial times through the 19th century, stressing the importance of written communication in the young nation. As early as 1673, regular mail was carried between New York and Boston following Indian trails. That route, once known as the King's Best Highway, is now U.S. Route 1. 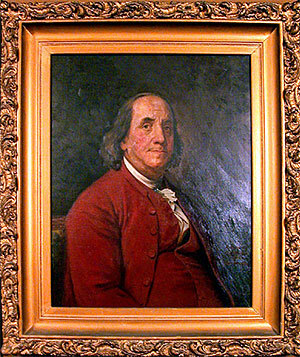 Benjamin Franklin, a colonial postmaster for the British government, played a key role in establishing mail service in the colonies, as well as in forging a strong link between colonial publishers and the postal service. Many newspapers that relied heavily on information carried in the mail customarily adopted the word "Post" into their title. Newspapers were so important to the dissemination of information to the people that they were granted cheaper postage rates. By 1800, mail was carried over more than 9,000 miles of postal roads. The challenge of developing mail service over long distances is the central theme of "The Expanding Nation," which features the famed Pony Express and the Southern Postal Administration of the Civil War. At one interactive video station, visitors can create their own postal route. Another interactive video challenges visitors to move mail bags from Philadelphia to New Orleans in the 1850s without losing any bags in wrecks and bad weather. Visitors are also invited to walk through a replica of the first post road, peek inside a Colonial mailbag, and climb into a mud wagon replica.